Packing boxes to move into your new home can be a very stressful time. Getting everything sorted and packed can take ages. Plus, once it’s all packed, you still have to worry about everything making it through the move. The most important thing you can do to protect your belongings is to know how to properly pack boxes. Not only is it important for you to know how to pack boxes, but you must also know what type of box to use for each item. 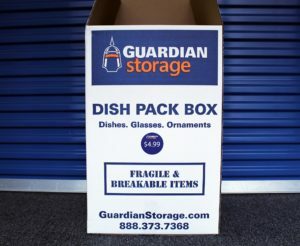 Light items require a standard large box while fragile items will need to be packed in dish boxes. Choosing the appropriate box and packing it correctly will ensure that your items stay safe and survive the trip to your new home. 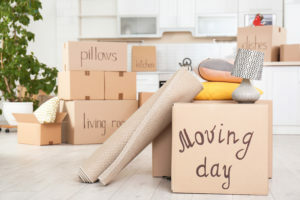 By following these packing tips on how to pack boxes for moving, you will know exactly what box you need for each item. Plus, you will know how to pack boxes to ensure everything in them stays safe from bumps and breaks. Before you can go into specifics, you will first need to know the basics of packing boxes. 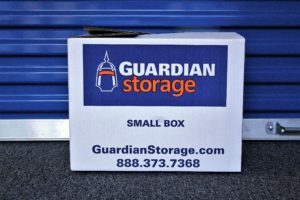 Begin by purchasing new, quality boxes for your move. You will want to find boxes that are made of corrugated cardboard. You can find them at most hardware stores, moving companies, and storage facilities. Beware of any cheap boxes that are made of a thin cardboard, as these will not protect from bumping or weight from other boxes. Free, used boxes from places like craigslist may seem appealing, but they come with a lot of risks. These boxes often contain bacteria from previously stored food. They may also have hidden insects that could damage your belongings. You’ll also want to have a lot of packing paper on hand. Packing paper is great for wrapping items to prevent from scratches or breaking. It can also be used to fill empty spaces in boxes to prevent items from shifting around in their box. To take full advantage of your packing paper, you’ll want to put some on the bottom and top of every box you pack. Choose a packing paper that is acid-free, as the acid can cause damage and discoloration to your items over time. Never use newspaper as a replacement, as the ink can easily transfer onto your items. Once you are ready to start packing boxes, turn them upside-down. Take the smaller flaps and fold them in first, followed by the larger ones. Then, use packing tape to fully secure the bottom by going the entire width of the box. You should only use packing tape to secure boxes, never masking or duct tape. Book boxes, or small boxes, are ideal for any heavy items you may need to pack. 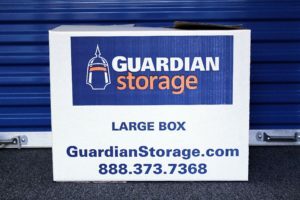 You will want to avoid packing heavy items into any larger boxes because they will quickly become too heavy to lift or rip through the bottom of the box. Book boxes are perfect for packing: books, tools, small weights, picture frames, silverware, files, cutting blocks, toiletries, or any other small, heavy item. Start by stuffing the bottom of the book box with packing paper to protect your items from dirt and damage. Once everything is packed into the box, stuff any empty space with packing paper to prevent damage from shifting. When packing books or files, make sure to put them spine-side down to prevent damage. If you are packing a lot of books, make sure to check out our blog on the best way to pack books. Make sure any sharp silverware is put in a guard to protect yourself. If you do not have a guard, stick all the sharp silverware inside of an oven mitt to make sure you don’t cut yourself when unpacking. You should also wrap the items in packing paper and write on the box that there are knives to remind yourself to be careful when unpacking. For all other fragile items in the box, use a generous amount of packing paper or bubble wrap to keep them safe. If there are many loose items, consider grouping them together in a Ziploc bag to keep them from shifting around and damaging other items. Dish boxes, also known as dish packs, are used to pack any fragile items you may have. Most people use them for packing dishes and glasses for moving. These boxes are considered safer than standard boxes because they have a double layer of corrugated cardboard, opposed to the normal one layer. Dish Boxes are perfect for packing: dishes, glassware, fine china, mugs, bowls, vases, lamp bases, small kitchen appliances, or any other fragile item you want to protect. Start by stuffing the bottom of the dish box with packing paper to cushion the items. Then, wrap everything individually with packing paper or bubble wrap. Some people also suggest putting styrofoam plates in between wrapped plates for extra cushion. After everything is wrapped, begin by putting the heaviest items into the dish box first. You will want to pack in rows, with plates and bowls on their side and cups and glasses facing up. Put another layer of crumpled packing paper in between each row to cushion the items and avoid damage. If you are storing a vase, lamp base, or decorative bowl, you will likely need to use a paper pad. Paper pads are soft, padded sheets for items that are too large for a standard piece of packing paper. Place crumpled packing paper at the bottom of the dish box, then place the item in standing up to avoid breaking. Stuff any excess space inside the box with packing paper or bubble wrap to avoid shifting during moving. Some people also use dish boxes for small kitchen appliances like blenders or toasters. To pack these, begin with a paper pad. Put the appliance at the corner of the paper pad, and begin to roll diagonally toward the opposite corner, tucking in the sides as you go along. Secure appliance cords with a rubber band or twist tie. Medium boxes will likely be the most common boxes you use for packing and moving. The boxes are large enough to fit a large portion of your room but small enough to avoid over-packing and making lifting boxes too difficult. Since these boxes will hold the majority of your belongings, it is important to properly label each one with the contents of the box and where it will be going for the movers. Properly labeling your boxes will save you a lot of time during the unpacking process. 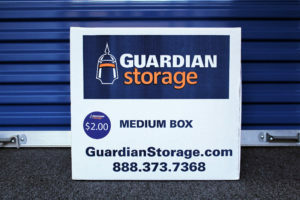 Medium boxes are perfect for packing: clothing, shoes, games, toys, decorations, pots, pans, cooking trays, and any other durable, miscellaneous item. Medium boxes should be packed similarly to all other boxes listed. Start by putting packing paper in the bottom of the box to protect from dirt and damage. Try to pack all similar items into one box instead of mixing all of them together. For larger, more delicate items like lamp shades, you will want to pack them separately from everything else. Make sure to fill all empty space with packing paper to avoid the boxes being crushed. Write “top load” on these boxes so that your movers know not to place heavy boxes on top of them. You will likely not need many large moving boxes while you are packing and moving, but they can come in handy for certain items. Large moving boxes should be reserved exclusively for large, lightweight items. These items are perfect for large boxes because they need a lot of room, but will not weigh down the box. Large boxes are perfect for packing: comforters, sheets, linens, towels, pillows, blankets, and curtains. These items generally need air circulation, and should therefore not be squeezed into smaller boxes with other items. Start by packing the heavier items like curtains or towels first, as to not weigh down the lighter items. These items can be folded and placed into the box. Pillows should be packed last to keep their form. The last type of box you will need while packing for moving is a wardrobe box. This box is perfect for clothing that should not be folded or put into a box or suitcase. Wardrobe boxes allow you to keep clothing hanging and protected during your move. This prevents creasing, wrinkling, and damage to items with delicate fabrics or sentimental value. 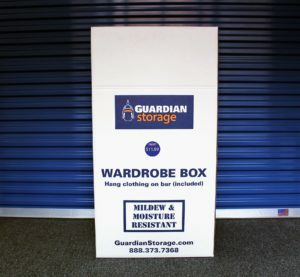 Wardrobe boxes are perfect for packing: dresses, dress shirts, suit jackets, coats, and other delicate clothing. Wardrobe boxes are not only important for packing and moving your clothing, but they are also incredibly convenient. All you have to do to pack is grab the clothing on its hanger from your closet and hang it in the wardrobe box. Then, when you move in, all you have to do is move your clothing back into your closet. You won’t need to iron or steam your clothing, and it will save you tons of time from folding, packing, and unpacking. For the best results, hang clothing using either wooden or fabric hangers. Wire hangers can rust, rip, and stretch fabric, especially if you plan to store your clothing for a long period of time before moving into your new home. To keep pests away from your clothing, you can buy cedar rings that go around your hangers to detract bugs. Depending on what clothing you choose to hang in your wardrobe box, you may have some extra space in the bottom. This is the perfect space for packing blankets, linens, or pillows. Make sure these items do not come up too high, though, as they will wrinkle your clothing. Since wardrobe boxes are typically the largest boxes moving companies will move, take advantage of them to pack other unusually large items. You may choose a wardrobe box to pack your vacuum, brooms, rakes, shovels, or even a large houseplant. Be sure to not overfill your wardrobe box. The metal bar holding your clothing can easily become too heavy and tear the box, leaving your clothing vulnerable. When in doubt, always opt to pack more boxes than try to overstuff them. Once you know how to properly pack boxes for moving, the next step is to take an inventory of your items to know how many boxes you will need. Make sure to keep in mind which boxes each grouping of items will need. Don’t forget to stock up on packing supplies like packing paper, packing tape, sharpies, bubble wrap, and paper pads. Check out our blog for more packing and moving tips.